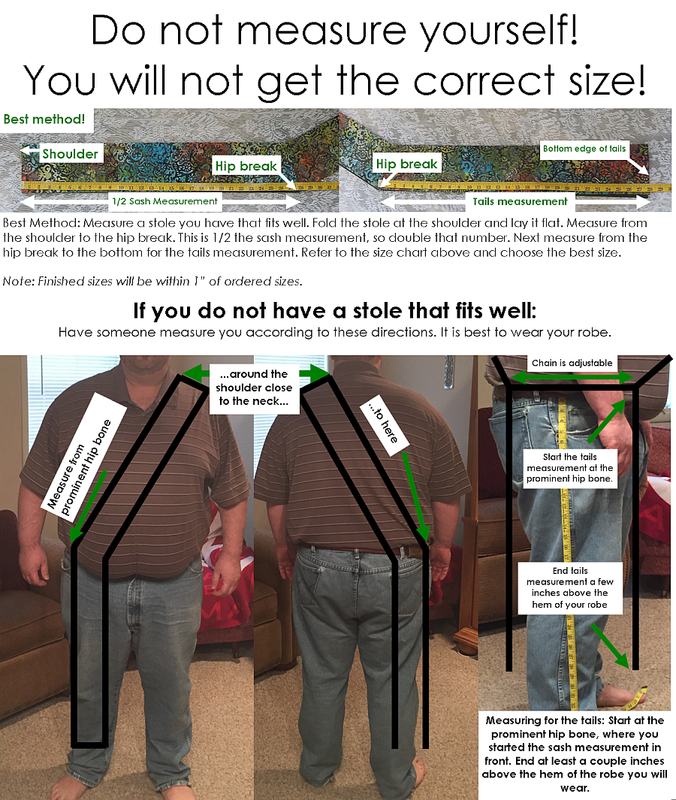 Use the diagram instructions below on how to measure a stole you have or to be measured. If you fit roughly within the sizes of the size chart below, order a standard size. If you find you need custom sizing, choose "Custom Measure" from the size menu in the listing of the stole you are purchasing. All hip connectors are 9 inch adjustable chains. Extra Small 4" or 5" 48" 24"
Small 4" or 5" 52" 26"
Large 5" or 6" 60" 30"
Extra Large	 5" or 6" 64" 32"
There is a $25 extra charge for custom size. Enter Sash and tails measurements in the box provided when adding the stole to the shopping cart. I cannot fill custom orders that do not have these measurements. NOTE: Extra Large and custom sizes may have seams at the shoulder.